Oh...I love that big flower!! It looks perfect will all of the polka dots. Pretty, pretty!! This card is SO PRETTY! You are definitely right; this stamp is awesome. Miss talking to ya. Email me whe you get a chance. Girl...your card looks gorgeous!I love the background, the colors, the coloring...You rock! 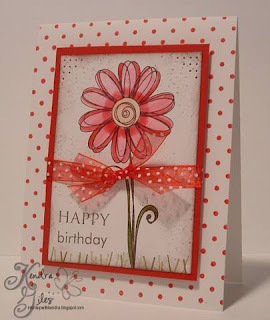 Gorgeous card, Kendra! I LOVE that flower! The colors are wonderful! What a great card - love the stamp. Beautiful card Kendra! How awesome! Beautiful card and wonderful colors! The ribbon accent is just right and pulls it all together perfectly. I love your blog! Very lovely! I really enjoy how you always have such great classic cards! Of course you are a bad influence on my craft budget...everytime you post I find myself needing something more or discovering a new stamp company. My visa loves you..keep up the good work!! How pretty. I saw some gorgeous red and white ribbon yesterday that I just had to have and now you have inspired me to use it! What a cute card! Love that ribbon. MUAH! I love this card! Your coloring is just magnificient. This creation is so Bu-tee-mous! Love it Kendra!